Rebecca Camhi Gallery is pleased to present the third solo show by Mantalina Psoma, entitled Far Away. Mantalina Psoma was born in Athens in 1967, and studied painting at the Berlin School of Fine Arts. She has participated in solo and group exhibitions in Greece, Italy and Germany. Her work has appeared in the book “Vitamin P: New Perspectives in Painting” (Phaidon Press), which features 114 of the most important contemporary painters worldwide. While the starting point of Mantalina Psoma’s work is photorealistic painting, she also draws elements from photography and film, capturing moments in time and focusing on the atmosphere of the surrounding space, as well as on the psychological states of the depicted characters. In her new work, Mantalina Psoma mainly presents small, self-contained paintings which, however, can be read as part of a continuous story that constantly shifts in space and time, and in which the viewer can insert and relive their own memories and emotions. 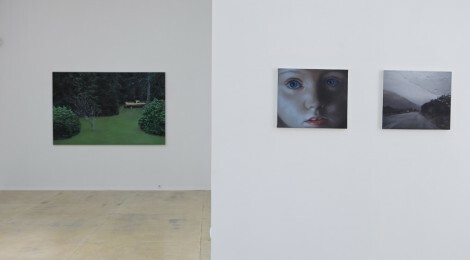 Portraits, landscapes and cityscapes remain at the core of her work, but in this show appear in a more mysterious form.